We welcome all-round specialist angler Lee Chatfield, a former matchman, into the Angler's Mail blogging fold as he reveals his tricks for catching big chub on the float. ONE of my favourite styles of fishing is float fishing and in particular I love float fishing on rivers. I cut my teeth in fishing on small local rivers followed by powerful tidal rivers around Sussex. I learnt a lot of valuable information and watercraft during this period of time and it helped me greatly during a successful match fishing career. My PB chub currently stands at 6 lb 14 oz – which was part of a brace that I caught from a stretch of the Dorset Stour several years ago on float fished maggot. Those two chub (pictured above) had been caught well over 7 lb just before I actually caught them but I was either unlucky with the weights of those chub or I weigh my fish accurately! A 7lb chub is one of my targets this winter and an 8 lb fish would be a dream come true. I have caught chub on virtually every method and bait that you can think of but my favourite method by far for chub is float fishing maggots. I have caught a lot of big chub on float fished bread flake in the right conditions but for me red maggot is guaranteed success whether the river is carrying a bit of colour or gin clear. If you are a competent float angler and are patient with feeding then a chub simply cannot resist eating maggots even on the coldest of days. Sitting out with big bait on cold days may result in one bite if your are lucky but float fished maggot can put a bag of chub together even in the coldest of conditions. No chub can resist a constant stream of maggots passing by them and they will eventually feed. Maggots also get chub into a feeding frenzy when they are competing to eat the bait which then makes them easy to catch. I have had many good bags of chub on float fished maggot in perfect conditions when the river is carrying a green tinge after fining down from a flood but I have also had good bags of chub during freezing cold conditions on a clear river when the line was freezing in the rod rings. I have actually had a few red letter chub sessions on some freezing cold days where I have questioned my sanity for actually being out fishing, and then doubted whether the chub will actually feed after several hours of inactivity. The key in cold weather is stable temperatures. If the weather is cold for several days then I know that chub will feed well but a sudden drop in temperature after a mild spell will have an effect on how well chub will feed but you can still catch one or two chub. My essential chub fishing floats and line. So what are my tactics for targeting big chub on rivers? I will take several float rods with me to cover different styles and each swim dictates what set up I use on the day. My first rod is my trusted 17ft Preston Sentient float rod, which is an expensive rod but top quality, paired with a Shimano aero match fixed spool reel loaded with 4lb Gardner Hydroflo line that I treat with line float or liquid PTFE which helps the line to float on the surface so that I can keep in direct contact with the float. The extra length on this rod allows me to keep the rod high in the air to lift the line off the surface and remain in contact at all times with the float. This is imperative with any float fishing on rivers but chub give incredibly quick bites on the float and you need to be able to strike instantly. I also spray my mainline with line floatant to help the line to float on. 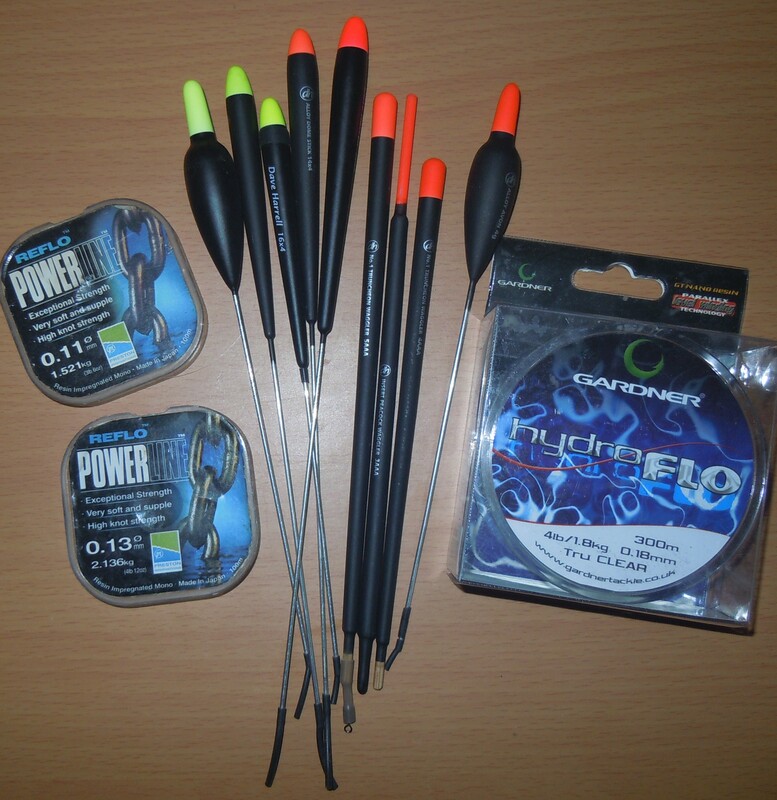 I always use Dave Harrell alloy stem Avon floats on this rod ranging from 4 – 10gr depending on the flow. These floats are fantastic. They cast superbly, have great sight tips for visibility and are incredibly stable in powerful rivers. I shot the float up with an olivette that is slightly smaller than the float capacity and lock it in place with a couple of shot. I then have one or two smaller dropper shot that will be No.6, No.4 or BBs depending on the flow. My hooklength is generally 0.13mm Preston Powerline which is incredibly strong and supple. I have landed a 30 lb common carp on this line! I always attach the hooklength to the main line via a size 12 swivel which helps the maggot to spin more naturally in the flow and also prevents the line from twisting. 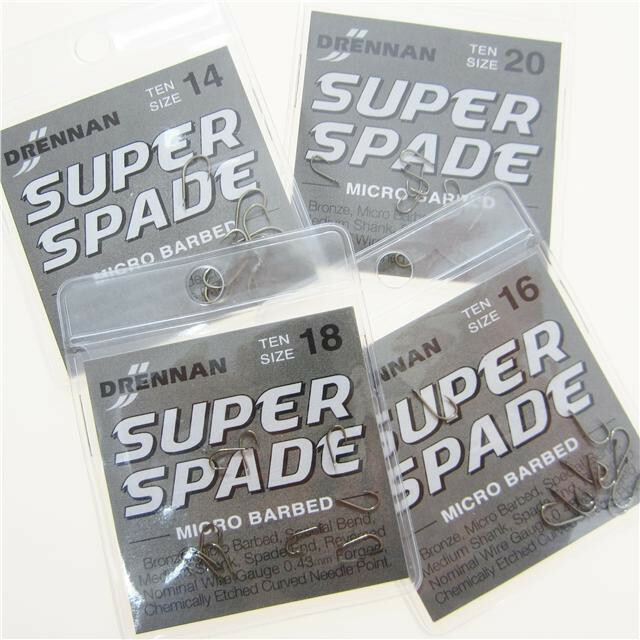 My No.1 hook choice is a size 20 Drennan Super Spade (pictured) and when these small hooks go in to the rubber lips of a chub they do not come out. They are also incredibly strong and I have landed bonus double-figure barbel on these hooks with the above mentioned set-up. I’m a big fan of these hooks for chub. I will occasionally go down to a 0.11mm hooklength with a size 22 hook on exceptionally hard days particularly if it is clear but in my experience the feeding is key and sometimes dropping down has not resulted in more bites. I always try to stay with the slightly stronger set up if I can because I do not want to lose a big chub that may snap me off in a snag. I can put a lot more pressure on big chub with the stronger set up. My other two rods will be a stick float and a waggler set up. The stick float rod is usually set up on my Drennan 15ft Ultralight with my Young’s Heritage Centrepin reel or a Shimano aero match fixed spool reel depending on the flow of my chosen swim. My choice of floats are usually a Dave Harrell alloy stemmed dome top stick float with sizes ranging from 10 x No.4 – 25 x No.4. The shotting pattern can range from a bulk shot with some droppers or a spread out shirt button style. The line and hooks are exactly the same as above. My third rod choice is a waggler set up which allows me to fish of bottom. I use my 14ft Drennan Acolyte Float rod for this set up with a Shimano Aero match reel and line and hooks are the same as the other set ups. My decision to fish a waggler really depends on the swim that I am in because the flow needs to be favourable to achieve the correct presentation. Sometimes the waggler can be a brilliant method because the chub are coming up in the water for the loosefeed and they want a bait run through at the pace of the current up in the water. The flow must be slower close in compared to the flow on the far bank or equal. If the flow is quicker closer in then you end up with a huge bow in the line downstream of the float and you cannot strike and connect properly with your bites. If I have a quicker flow close in then I will not even set up the waggler rod. A 6 lb 6 oz chub I caught on the float from the Avon. One of the key components to successful chub fishing is in the feeding. 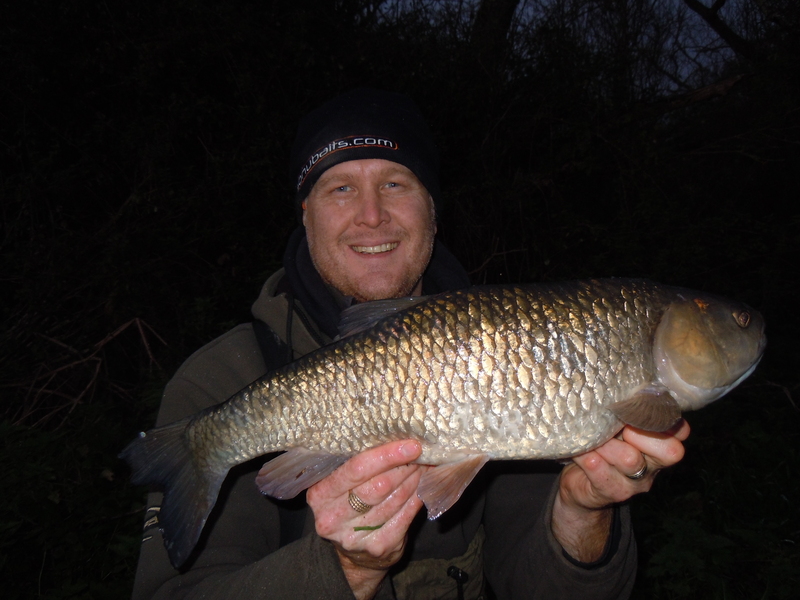 Chub fishing can be like a game of poker at times where you are trying to second guess your opposition and trap them. I generally take a gallon of top quality red maggots with me for a session and expect to feed approximately 1 pint per hour on average throughout the session. I will always feed my swim when chub fishing for at least an hour little and very often with maggots before I even contemplate casting in. On clear rivers such as the Dorset Stour and Hampshire Avon where I do a lot of my chub fishing, I will often feed for several hours before casting in. This is done to gain the confidence of wily chub that have been fished for on many occasions on heavily pressured stretches which has made the chub very wary. If you can gain their confidence and get them competing for the maggots then they become a lot easier to catch. I will always start with a little but often feeding pattern and feed approximately 30 maggots every minute or so until I start fishing. Then I will slightly increase the feed and feed each time I cast out. It can pay to vary feeding before you cast out to feeding after you have cast out just to vary things and see which approach is responding better. I will start on double red maggot but 90% of the big chub that I have caught fell to a single red maggot. Big chub are incredibly canny and will often ignore double maggot. After catching a couple of chub it is not uncommon for the swim to go quiet because the fish have become cautious from the commotion. One little tip here is to stop fishing and just feed the maggots again on a little and often basis which will regain their confidence. I will sometimes stop fishing and just feed again for up to an hour on very hard days. It can be a very disciplined tactic because by continually running the float through you will ruin the swim. One other tip for feeding is suddenly increasing the volume of feed into your swim. I will often stop fishing and feed a full pouchful of maggots every minute for around 20 minutes and then cast the float back into the swim. I did this on a recent session on the Hampshire Avon where my swim had gone dead for over an hour after catching nine chub with five over 5 lb. I upped the maggots as I have just described and my next three trots resulted in chub weighing 5-7, 5-14 and a really stunning brute of 6-6. Float fishing on rivers is not an easy method to master and it can be physically demanding but the rewards are there to be had. By putting time in and practising the method then you can be sure to catch more fish. An angler who is competent at float fishing will catch a lot more fish on rivers. I have caught far more big chub by float fishing than on any other method. Give the tactics a try for some end of season fun!